Two former governors of Idaho, and the incumbent, have gotten involved in yet another serious dust up over spent fuel and the Department of Energy’s (DOE) laboratory located at the eastern edge of the state. At issue is whether current Governor C.L. “Butch” Otter (right) will allow DOE to send two bundles of spent nuclear fuel from a commercial nuclear reactor in Virginia to the Idaho National Laboratory (INL). The material is needed for R&D work on electrochemical recycling of spent nuclear fuel. 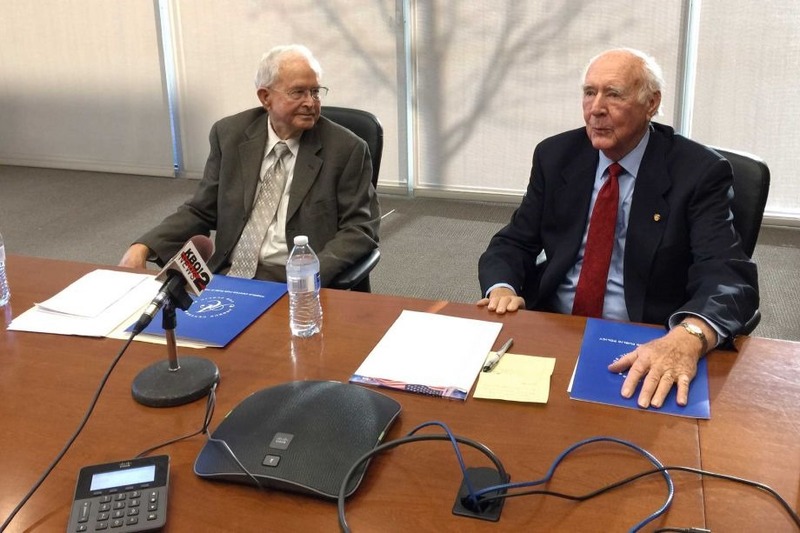 What has former Idaho governors Phil Batt (left) and Cecil Andrus (right) in an uproar, and giving statements to the press this week, is that DOE still isn’t in compliance with a 1995 agreement that both men bet the limit on during each of their respective tours in Boise. Andrus went right for the jugular in terms of characterizing Otter’s tentative agreement to let the spent fuel be shipped to the INL. He said that Otter’s legacy to the people of Idaho would be to create a de facto “Yucca Mountain”, or interim retrievable storage facility, for spent fuel from the nation’s over 100 nuclear reactors. With Nevada Sen. Harry Reid having effectively spiked any effort to open Yucca Mountain as a permanent geologic repository for spent nuclear fuel, eyes have turned to Idaho as the next best place, a vision that keeps Batt and Andrus awake at night. This is bipartisan angst. Is the future of Idaho’s potato and fish farms at risk? Batt said that the snake river aquifer, which flows under the INL, and emerges into the Snake River 150 miles or so to the west, would be at risk. While Batt didn’t accuse Otter, and Energy Secretary Ernest Moniz, of planning to french fry Idaho’s potato crop right on the vine, he did make an economic case for his view of the harm that could occur. He said that while DOE might spend $10-20 million in R&D money at the lab, an uncontrolled release of radioactivity that gets into the aquifer would ruin the state’s potato crop and wipe out its famous fish farms. While Andrus and Batt lay on the barn burning rhetoric, there are some important facts behind their anger. The landmark settlement agreement between the state of Idaho and DOE set deadlines for dealing with several types of nuclear waste that had accumulated at the Idaho lab. Two types, spent navy fuel from military ships, and a huge volume of liquid radioactive waste leftover from reprocessing the naval fuel, work that ended in the early 1990s, both are subject to the terms of the agreement. For Andrus and Batt, who had to defend the cleanup agreement in a statewide referendum in 1995, any retreat from it is seen as a violation of public trust. Voters upheld the agreement by a 3:2 margin statewide. On a county by county basis, only the international destination resort area of Blaine County that is home to Sun Valley, and panhandle voters citing downwind issues from Hanford, provided geographic spikes of opposition to the plan. In Sun Valley movie Star Bruce Willis and friends provided funding to fight the settlement arguing for a far more stringent, and unworkable, plan. One of the major reasons for DOE spending several billion dollars so far in cleanup at the Idaho site is that radioactive plutonium and uranium particles from the navy spent fuel reprocessing center were found to have migrated underground at least 200 feet from the surface downward towards the aquifer. It flows through a matrix of ancient lava flows and clay lenses from the Lost River Mountains on the east to emerge at the Snake River at an area called Thousand Springs in the west. There it surfaces in a huge cascade of fresh water that pours into the Snake River and which irrigates the western half of the state’s potato crop. No one wants to think what would happen if radioactive contamination got into the aquifer. So far that hasn’t happened which is why the cleanup work needs to keep going. While the naval fuel has been moved from wet to dry storage, and doesn’t have to be out of the state until 2035, the million gallons or so of liquid “sodium bearing waste” is supposed to be run through a first-of-a-kind “Integrated Waste Treatment Unit” as part of the Idaho Cleanup Project. So far, the plant, which had an initial price tag of $150 million, now has a cost nearly $600 million and it still doesn’t work. Once DOE’s contractors get it working, the plan is to turn the liquid waste into a dry powder, seal it up in steel canisters, and ship them for permanent disposal to the Waste Isolation Pilot Plant (WIPP) in New Mexico. Another problem for the Idaho Cleanup Project, in terms of compliance with the settlement agreement, is that WIPP is currently closed and undergoing a $500 million, two year repair due to an explosion and fire that took place last February in one of the deep underground caverns. The site won’t reopen until at sometime in 2016 and even then on a limited basis. DOE has determined that another of its facilities, the Los Alamos National Laboratory (LLNL), violated WIPP’s stringent waste acceptance criteria mixing volatile waste and chemicals in the same shipment. The unapproved substitution of a so-called green absorbent material may have been a key cause of the fire. For its part, DOE’s response to this mess has been to cause the LANL contractor to fire at least four senior managers from the prime contractor and seriously reduce the contractor’s award fee for the performance period in which the shipment took place. None of these acts of bureaucratic retribution will reopen WIPP any faster. In fact, the expertise of the people LANL fired could have been put to work fixing the problem. Accountability for the explosion at WIPP rests in part with a subcontractor who actually packaged the shipment. That hasn’t stopped the State of New Mexico from hitting DOE with a record $54 million fine over the fire. State officials personally delivered the notice of violation to Energy Secretary Moniz. In the 1950s Idaho’s Arco desert was seen as a suitably remote place to dispose of highly radioactive trash from the Rocky Flats nuclear weapons plant in Denver. A huge volume of materials was dumped into open pits and trenches at a site about 60 miles west of Idaho Falls, ID. The Idaho Cleanup Project has made good progress retrieving this material, packaging it safely, and shipping it to WIPP. 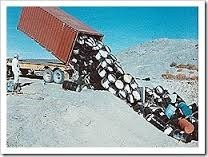 Now those shipments are on hold as well due to the problems in New Mexico. This delay has also raised the ire of Batt and Andrus who see it as one more reason why DOE cannot be trusted to keep its promises. How much spent fuel is involved in the dispute? If that’s not enough, consider that there is also a dispute over exactly how much spent fuel would be sent to Idaho. DOE Secretary Moniz said through an agency spokesman that the total amount is 25 spent fuel rods, about 100 pounds of material. However, Batt and Andrus claim the amount is much higher involving 50 spent fuel bundles each weighing 1,500 pounds for a total of 38 tons of material. They cite a letter from Governor Otter that they say contains these numbers. Update 1: 1/18/15 ~ The Idaho Falls Post Register reports it’s two shipments of 25 spent fuel rods each. Each one is 45-50 kg of heavy metal. 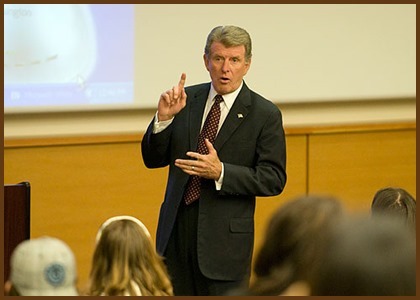 Where this leaves Governor Otter is that he’s getting a lot of heat over an R&D plan for the Idaho lab. Yes, about 6,000 people work there, and the payroll brings in a lot of income tax revenue. Even if he prevails, Otter may not want his legacy to be tarred with the Batt/Andrus brush as the man who overturned the 1995 settlement on nuclear waste. Paradoxically, it was at the Idaho lab where naval spent nuclear fuel was recycled. There the seeds of a solution for the national inventory of spent fuel can be found. Reprocessing of spent fuel, which has been carried out for decades in France, and which forms the basis for making new mixed oxide fuel (MOX) for about three dozen commercial reactors worldwide, could be part of a long term resolution of what to do with the stuff in the U.S.
Just don’t offer Idaho the opportunity to pursue it no matter what the scientific and economic value might be. As long as Batt and Andrus are around, the message to Moniz is going to be “what is it you don’t understand about “no”? As for Moniz, he said in a radio interview in Washington, DC, on January 16 that “DOE has to learn to get on top of problems before they get out of control.” Yup, that would be about right.